Aeron Desk Chairs - The Ultimate Desk Chairs for All Purpose. Read more about its advanced ergonomics, its customizable features, its Aeron chair warranty and where to buy. Desk chairs are an integral part of our professional as well as personal life. I was not really into these fancy chairs and ergonomics until I discovered my increasing bad posture, neck and back pains. It was a late realization, actually! But as they say, better late than never. With more than 12 years of experience in making world class chairs, Herman Miller (the company) took the world by storm when it introduced the advanced ergonomic Aeron desk chair. Before we start talking about the Aeron desk chair, here is a summary of what to look for in a desk chair. What you should look for in Desk Chairs? Click here for more tips on choosing an ergonomic computer chair. Going by the price, the Aeron Desk Chairs are quite expensive. However, if you weigh out the pros and cons, you actually save money if this chair is the right one for you. Let me show you how. When compared to most of the desk chairs available on the market today, the Aeron Desk Chairs are not just excellent in quality and design. They are made with advanced ergonomics (which I will elaborate below). They are long lasting too, with a warranty of 12 years. They are made designer-style and earth friendly, making the Aeron desk chair one of the most enviable pieces of furniture that you can have. The look of the Aeron Desk Chairs is distinctive indeed. Often times, it might seem to be more appropriate for a museum than for a home. Or maybe it could pass off as in the office of an architect or a fashion designer. You can choose the Aeron chair to be made in a variety of colors and fabric (covering only) - so if you are going for a more professional look, of course black or grey will be your top choices. The sporty modernized look and the unique design of these chairs often make them talking points. Combined with the great look that these Aeron Desk Chairs have, they have additional capacity of creating an experience that would be pain free. It is because of the super ergonomic design of these chairs that it is easier to use and comfortable to sit at the same time. People with back problems can now be at peace with the lumbar support that the Aeron Desk Chairs provide. There is this patented and trademark feature of the chair called PostureFit. There are additional adjusting capabilities that allow users to achieve their desired setting for matching the type of body they have. 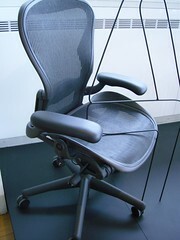 There are different models of Aeron Chairs Herman Miller and these chairs have been designed for different body types. At Herman Miller, they truly understand customization. Therefore, the different models of chairs they have built not only have advanced ergonomics but also customizability and add-ons. You can start with a basic model, such as this one, Aeron Chair Basic by Herman Miller- Graphite Frame - Carbon Classic Size B (Medium) . The basic models come in small, medium and large, though medium and large are the most common chair models. You can choose whether you want fixed or adjustable armrests etc. They come in different colors too. It seems that the Aeron Desk Chairs designers, Herman Miller have thought about just everything that a Ergonomics demanding person would want in a chair. The Aeron Desk Chairs are perfect for all purposes. It is great for your office and workplace and excellent for your study at home too. As long as you work on your desk, this chair seems to be your best friend. Some users report greater productivity and ease of their usual back problems. Some users go as far as to say that they went around looking to buy a used Herman Miller Aeron chair especially for home, so that they can enjoy the same comfort, if they should bring some work home to do too. See what customers have to say later in the review. Herman Miller is more than a decade old in the making of chairs and ergonomic furniture. Not only has these ergonomic chair designers created a long-lasting and reputable name for itself, but it is also responsible in production of Aeron chairs by using recycled materials. These are green chairs and come with 12 years warranty. Which ergonomic chair company has matched its warranty? There are different models and ways to customize your Aeron Desk Chairs. While the basic model has limited facilities and cuts out the features like adjustable arms, lumbar support and front tilt; it might suit those who feel they do not need them. After figuring out what you need, the chair will be delivered to you unassembled. This is to provide greater customization on your end. Who else will know your body and your needs like you to? But not to worry, there are instructions provided. Most customers say it is easy to assemble, and even easier if you have an extra pair of hands for help. We all have different bodies and different needs so we need to take some time to learn about the ergonomics of sitting. Then we'll need to analyze our body needs. Why do I say this? This is because if you buy a Herman Miller Chair like this one, you may be required to take some troublesome measurements - just to be sure. Also, you still need to practice good ergonomic principles (of course, by learning them first) when sitting on your Aeron desk chair, otherwise, it will not be used to its fullest potential of comfort and protection. The size of the chairs has been classified as A, B and C. the price varies with size as well. 12 Years but only if you are the first owner of the Aeron Chair. Read more about the Aeron Chair Warranty. "I've used the Herman Miller Aeron chairs for years at work. I love them. They are as comfortable as high quality leather chairs, but the mesh prevents the chair from building up heat as leather tends to do." "I love my Aeron chair; it's very comfortable to sit on for hours on end when I'm on my desktop computer." The basic model of Aeron Desk Chairs lack adjustability. It only lowers and raises, nothing else can be done. That is the only complaint. Otherwise, these chairs are comfortable and very easy to use. These are compact and well designed for all purpose use. For more reviews and updated information, you may go to our comprehensive Aeron Chair review or check out the ones on Amazon. Thank you for reading 'Aeron Chairs'!